I don’t do a whole lot in the PBM pricing world these days, but I remember some of the process and the underwriting steps. 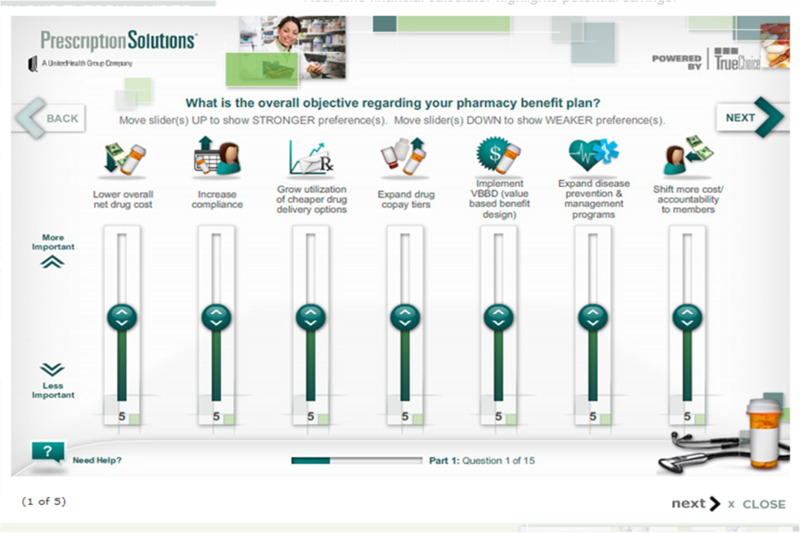 That being said, I was really impressed with the new Prescription Solutions online Pharmacy Benefit Advisor Tool (go to http://mybenefitpreferences.com). You go through a few basic steps to get an idea of how much you (payer) could save (with a very nice GUI). Now, in reality, PBM pricing is never that simple, but what it effectively does is help articulate the savings that different decisions can create in a real-time setting. It also forces some dialogue around issues – adhererence versus drug cost…which matters more to you? I also think it could be a great way to help consumers understand the costs and savings associated with certain decisions. I would also guess that the sales team at Prescription Solutions will find it helpful especially in the smaller, self-funded world. This is great. It’s a nice improvement over what they announced a few months ago. With this, and their repositioning of the business under Optum brand umbrella, I guess the chance of UHG selling or spinning off its PBM arm is looking less and less likely.